The TB Evolution 5 is a top model shaft driven 4WD chassis being improved for better performance. The TB Evolution 5 MS features double deck structure with 2.5mm lower and upper carbon fiber decks and redesigned motor position for optimizing handling performance. Separated aluminum rear upper deck enables more rigidity and easier maintenance of parts such as the spur gear. In addition to the front one-way differential, rear ball differential and aluminum diff. 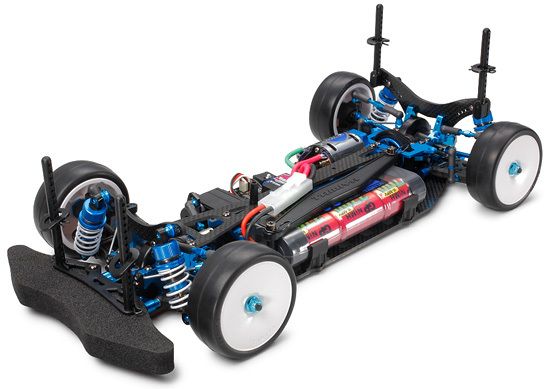 joint, the TB Evolution 5 MS chassis combines the TRF416's excellent parts such as uprights with 1050 ball bearings, center mounted steering system and aluminum suspension mounts. 3mm carbon front/rear damper stay with various mount positions allows for a wide range of settings. The TB Evolution 5 MS is the strongest shaft driven 4WD with improved maneuverability and sharper steering response giving you a competitive advantage.